Last night, the NCAA tournament predictably ended with the monotonous Mainliners mangling Michigan. This year, we of the High Committee found ourselves agnostic to the tournament that serves as our inspiration. Whereas competitions past have featured March Madness monikers like God Shammgod, Sindarius Thornwell, and Koko Archibong, this year no one in the NCAA tournament was able to crack our Super 64. Ages ago, Mikal Bridges and Moritz Wagner may have been shoo-ins, but, in the hyper-competitive world of 2018, they couldn’t make it past our first cut. 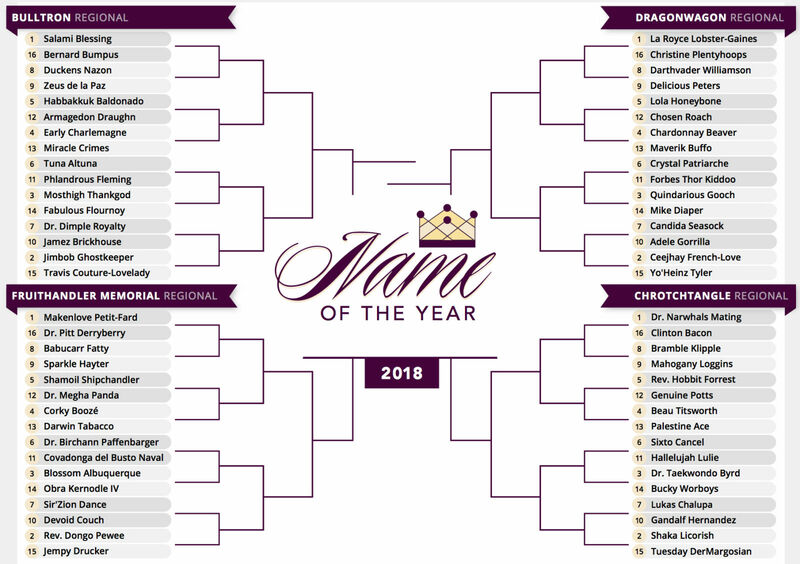 As Bulltron Regional voting continues, we post now the Fruithandler Memorial Region. Formerly the Sithole, this region has been rechristened for at least this year in honor of 2004 Name of the Year and Hall of Name inductee Jerome Fruithandler, honored for the “evocative imagery of his surname and its delicious contrast with an always tasty first name,” a beloved business owner and father. 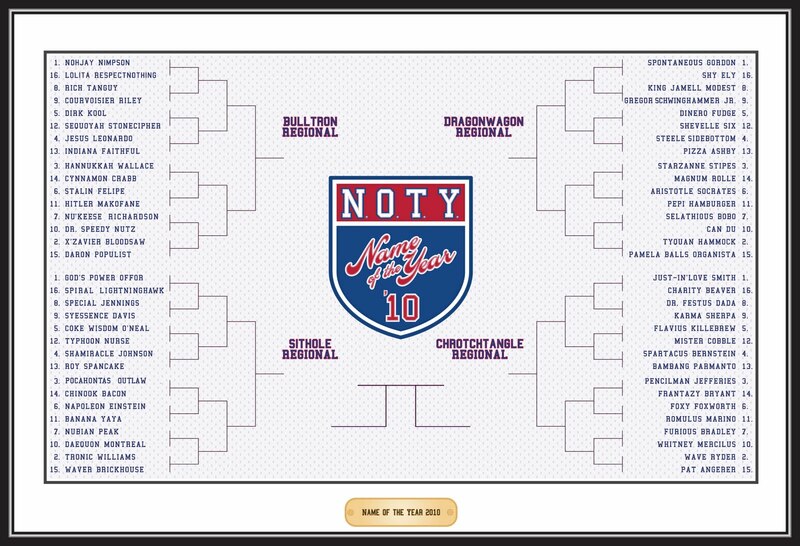 Here at NOTY, we love dads. Last year, 12-seed Headman Dadzie upset High Committee favorite Jeffrosenberg Tan. 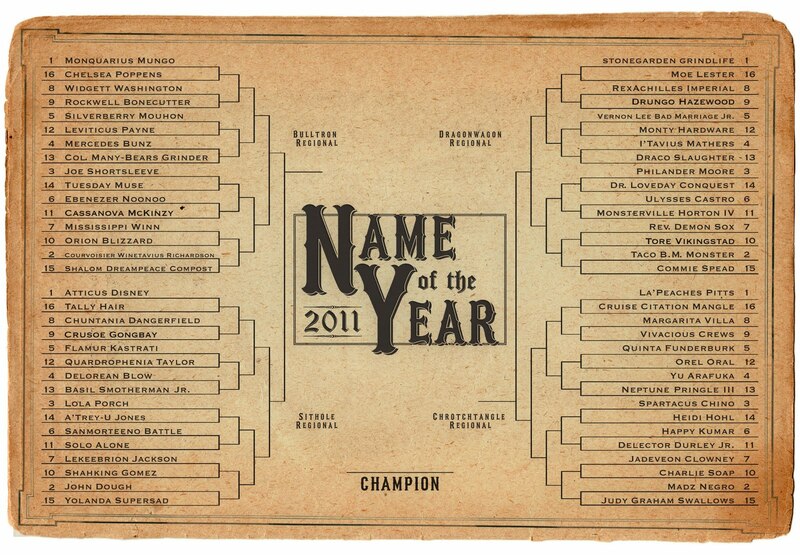 The year before, we crowned the great papa himself, Pope McCorkle III, as Name of the Year. While feminists understandably speak of a desire to smash the Crystal Patriarche, we have a soft spot in our heart for dads, but one fatherly feature we do not favor is the flat, predictable Dad Joke. A good pun name like Genghis Cohen will always make us grin, but lame wordplay like “Hi Hungry, I’m Dad” has no place in our bracket (until one of you sends us a contestant named Hungry, or, even better, Hungry Dada). Indonesia even has a word for jokes so lame you cannot help but laugh: jayus. We don’t understand why record stores failed. They had record sales every year. People keep asking us whether the Big 12 is better than the SEC. Sorry. We’re only familiar with the Big Four. Pro tip: Never buy flowers from a monk. Only YOU can prevent florist friars. Normally when a verified, staid account veers off script, the intern or employee behind the change gets the ax. In this case, though, it turns out that the rebellion came from the top—the culprit was Shipchandler himself. Today, the jokes continue, drawing confusion, groans, and even the ire of one narcissistic billionaire Presidential hopeful: Mark Cuban. While the Director has a cerebral social media strategy to explain his shift, we humbly offer another explanation: His family grew tired of the jokes and he needed another outlet. If Shamoil has a chance to become Director of the Fruithandler Region, he’ll need his jayus-jiving audience to protect him from first-round upset by northeast Ohio pediatrician Dr. Megha Panda. 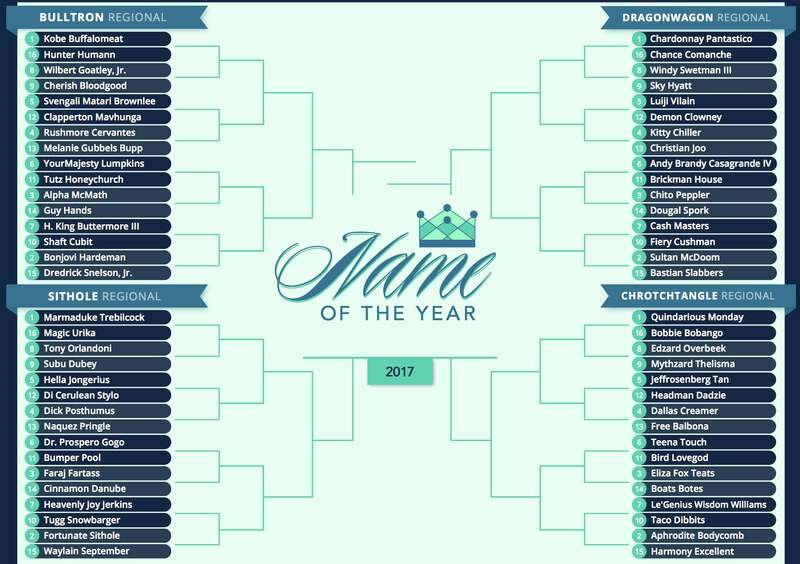 Vote on Shipchandler's matchup and the rest of the Fruithandler Region below, and don't forget to follow us on Twitter.